It is unfortunate that the fugue has too often been portrayed as such an inflexible construct as to inhibit students from exploring it without the freedom of expression that it truly offers. It's interesting to note to students of history that rarely in the literature from whence the fugue arose does the composer even refer to it as such. Johann Jakob Froberger (1616-1667), for example, often titled his works that employ a fugal structure as fantasias, or even capriccios - each obviously referring to a compositional flight of fancy rather than the practice of a dusty method of rote contrapuntal exercises. As well, it is crucial to understand that fugues were often just parts of larger pieces, not even separate as in J. S. Bach's (1685-1750) famous sets of preludes and fugues. Dietrich Buxtehude (1637-1707) was the foremost exponent of the praeludia, a free-formed structure that featured short fugues (with related subjects) sandwiched between sections that changed character, mood, and texture with great fluidity. It is a great mistake of academic myopia to only model fugal pieces on the works of Bach under the misconception that he was somehow the culmination of the style. Careful study and listening with an open mind to other equally gifted practitioners of the Baroque will yield the student and music lover alike not only a wealth of wonderful, albeit lesser-known music, but also inspiration regarding methods that he did not employ. At the end of this chapter a listening list is provided for further exploration of some of these treasures as well as a guide to composers who have developed and implemented the fugue in subsequent periods through the Modern and Contemporary. The following model is a three-voice fugue implementing some of the most significant techniques associated with this form. The student should endeavor to work with this model step-by-step in the creation of an original project. AUDIO and MIDI files can be listened to on this page or downloaded separately here. 1. The Subject. Before setting pencil to paper on our grand staff of our score, we should begin by constructing a subject (which is the title given to the principal theme of a fugue). It was very common in the North German Baroque, for example, to use repeated notes at the head of the subject. The reason for this, most likely, is so that its subsequent statements are clearly discernable within a complex texture. Next, we must give contour to our melodic line, imbued with rhythmic activity and a climax note to provide for a distinct profile. Finally we will complete the subject by composing a closing idea with a somewhat contrasting character to provide the theme with dynamism. Now that we have a suitable subject, it can be truncated, extended, layered, and/or manipulated at will within the course of the piece. One of the basic manipulations of a subject is to invert it. Inversion deals with interval or contour reflections as a means of compositional development and economy. Therefore, in this draft we can outline the subject inverted to get a sense of its character and where it could possibly be used as we write our piece. 2. The Exposition. At the opening of every fugue, each voice enters (in an order determined by the composer) with a statement of the subject. However, alternating with the subject in the key of the piece, a voice will enter with an answer - this simply means a statement of the subject in the dominant key. To complicate the matter, the answer can be labeled as being either tonal or real. A real answer means that the transposition of the subject to the dominant is literal while a tonal answer allows for some minor alterations to appear almost as if it still functions within the home key. In this example, we have opted for a real answer. Sometimes, a composer can choose to interject a brief interlude between pairs of statements. This would normally consist of free material based on a motive from the subject. If we would opt for this solution, some room would have to be made between the soprano and bass entrances in this piece. However, in this first fugue, we will keep to the more compact method. 3. Counter-Subject or No Counter-Subject? Once we have outlined the exposition as above, we need to continue each voice once it completes its statement of the subject with new melodic material as a counterpoint to the successive statements in the other voices. In some pieces the new counterpoint can be dubbed a counter-subject, but only if this material often returns alongside statements of the subject later in the piece. So how can we tell at this point if this fugue has a counter-subject? We can't, but it remains relatively unimportant for the moment; the great majority of fugues do not have such regularly recurring material, so don't feel constrained to do so either. 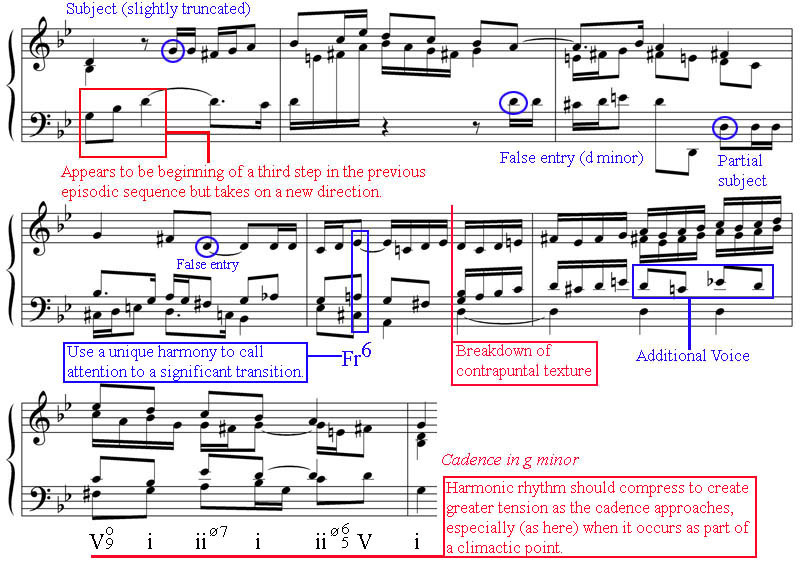 Note some important aspects to our completed exposition: a) during the statement of the answer, the harmony should transition to the dominant key region, but re-transition to the home key in preparation for the entrance of the next statement of the subject; b) interlace the articulations between the contrapuntal voices to maintain a vital rhythmic activity, but also allow for the occasional pairing of voices in parallel thirds or sixths as to not over-complicate the texture; c) allow for some brief rhythmic cessation, especially when drawing close to a cadence, to allow the listener's ear to rest in anticipation for a resurgence of activity. 5. Modulations. Following this brief episode, in which a secondary dominant at its conclusion allows for a modulation to the relative major, we have an entrance of the subject transposed, appropriately, to Bb. Note that the subject is slightly altered here in a few minor ways. This transformation/development was made to reflect the changing character of the new key region. However, the contour and overall profile of the subject remains intact. Note that the final two beats of bar two of this entrance include chromatic modifications to the counterpoint which implies yet another secondary dominant, this time directing the music to the subdominant instead of cadencing in Bb. The following entrance in the bass voice confirms this modulation with a statement of the subject in c minor. This time, however, the final passagework in the supporting contrapuntal voices verifies the modulation as we cadence in this new key. 6. The False Entrance. Another episode begins at this point with a false entrance of the subject in the soprano. The concept of the false entrance is to bring attention to a voice by stating the head motive of the subject (or a portion of the head motive sufficient to identify it as being subject material) and then allowing the theme to take a drastically different turn. In this case, what at first appeared to be an entrance was actually the beginning of an episode. We have adopted another common fugal device for this episode and allowed one voice to drop out entirely. This permits the ear of the listener to temporarily relax with a thinner texture while simultaneously creating a sense of anticipation for the absent voice to make its reappearance. 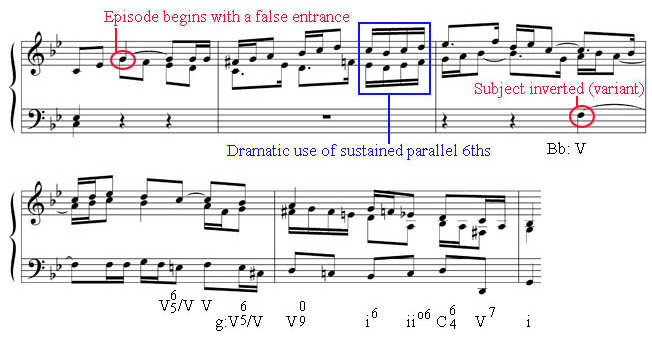 Note the dramatic use of sustained parallel sixths in the second bar of the episode: remember, counterpoint does not mean that every voice must be doing something very different in every situation. In fact, a sudden collaboration between voices can instill poignancy to a passage or possibly signal the imminent arrival of something new. In this case, it accomplishes both. Following this episode, the long awaited entrance of the bass occurs, this time with our subject inverted. Although it is not as common to have a subject inverted without a counter-exposition (which is essentially an entirely new exposition within the course of a fugue), one must remember that this form allows for great freedom in interpretation by the composer as to how it can develop. This entrance brings us back to the relative major. Note that while the contour and many of the details of the subject inverted remain intact from the draft we made before beginning the composition, allowances have been made for some variance in the details of the material. We have also slightly extended the subject inverted and modulated back to our home key by the cadence point. 7. The Sequential Episode. Another episode begins at this point, this time employing the most common device in such sections of a fugue, a sequence. Sequences, as we know from other studies, consist of select materials that are repeated and transposed. Each time the material is stated, it is called a step within the sequence. During the early Baroque, composers such as Samuel Scheidt (1587-1654) took great pleasure in creating sequences within fugal works that contained many steps so that the listener could not anticipate when they would end. As the era continued, however, sequences saw a great reduction in their steps to the point when two to four became the norm. 8. The Climax. The next stage witnesses a flurry of different activity including a series of false or partial subject statements leading to the climactic moments of the piece. Note the use of an augmented sixth, a harmony not previously heard in the course of the fugue, to call attention to this significant transition. Once again, parallel voices help create this dramatic moment, supported by an insistent repetition of the dominant in the bass voice and a sustained single harmony (V) for three beats. To add to this, a surprise fourth voice joins the texture. Immediately following the prolonged dominant region, the harmonic rhythm quickly compresses to create even greater tension as the cadence approaches. So is this section an episode? Not really since it does not function as a bridge between material but rather provides for its own closure. In effect, a climax can be a free section interpolated within the course of the fugue. 9. Stretto. One of the most popular devices used to bring a sense of urgency to a fugue is the stretto. A stretto, strictly spoken, is the overlapping of subject entrances (or other main materials). Sometimes, as here, this can mean overlapping only the opening motif of the subject, but other times the subjects are allowed to be stated in their entirety. The Italian word simply means 'to tighten', so in a fugue we are trimming the time between subject statements. 10. Cadenza and Coda. A brief cadenza is interjected here in a style that well suits the keyboard. Cadenzas are not at all necessary to a fully functioning fugue, but will be used here as a sample. When they do occur, they tend to do so during the final moments of the piece. This cadenza seamlessly flows into the counterpoint against the final, albeit partial, entrance of the fugue that acts as a coda. Next, we'll bring all of these sections together and examine the complete fugue.